" ... the land mourns ..."
I often drive around my city. Often, I mourn. I see all of this and more. God, please don't stop breaking my heart for the cities. Keep me tender and wounded within for the brokenness I see. Give my soul no complacency or retreat from the nagging call to bring this all before You and bring Your call of steadfast love to the ears and hearts of people. and even the fish of the sea are taken away." the God of Jacob does not perceive.”"
Father ... I am a "dis-tractable" soul. You know that and I know that and I am amazed how You have accommodated that in me and taught me to manage within the margins of my "dis-tractability" to find a tract within which I can live and seek you and find traction for my journey. I don't slip as much as one might expect. I don't wander as far as I might. I don't fall off as many cliffs as I might fear and I don't lose sight of You as much as I would were it not for Your hand upon me. I live by grace, in grace, and with much grace poured over me. I swim in it, drink of it, and am refreshed daily by it. Father, You know why I am up so early. I need not be commended. I need this to survive. It looks like I am doing many things .,. many things ... many distractions creeping in ... but in fact, I am up for One Thing. I am here to meet You. Around every corner, You are there. In the thoughts and words of friends, You are there. In the prayer requests that tumble down into my lap. the scriptures that emerge constantly, the thoughts that come and go, the words that linger and are recorded, You are there! You are there and I get to spend this time with You and some of it with some of my dear and precious friends who, I pray, will share in this blessing. You are HERE! You are in this space, this large space that I must make for meeting you, this block of time, this TRACT where I can find some TRACTION because I am so dis-TRACT-able. Keep me on tract today, Lord. Shine, rising sun upon these steps I take. It is a dark world this morning, but it is morning. Early, comes morning and only hopeful people venture forth. The world is dark. Is it? Then why is it that I see the road before me and little obstacles in my path? Why is it that I can see if everything is dark? It must be something else because it is not totally dark. It is in the balance and I can see. Can you see? Brahms walks with me as I walk, awakening the dawn. The slight light of dawning informs my steps and I hope. And hope rises and the sun rises, summoned by Composer and Conductor. God cares for your soul. How can a statement be true and untrue at the same time? Many a man or woman has echoed the psalmist’s cry in lonely and despairing hours. Many have passed though the dark tunnel of desolation “like sheep without a shepherd.” In those times it is true that no one really knows the darkness within and no human being cares at the level that caring is needed. The statement is true in that it expresses the essential emotions of the moment. It is not true in the deeper, larger sense, for there is always One and often, others, who are ready to come to your aid – yes, you, for the psalmist’s story is your story and my story. It is also our challenge to be present, sensitive, and ready to respond to the heart cry of others. Who might you see as you look around, wandering in a sea of ambiguity and hopelessness? Who is it within your reach that needs to know that he or she is not alone? Who s it that can be reminded of God’s love by your loving touch? Who is it that can learn of God’s care through your care? Start with yourself, wounded and battered by life. Be reminded that God cares for your soul, your life, and your deepest self. Receive His love at the point of your most profound pain. Then allow Him to fashion you into an instrument of healing and grace. Can God really use a wounded healer? Can He take a broken soul and accomplish His purposes through that man or woman? I think of David and I say, “Oh yes.” I also think of great men such as Abraham Lincoln, a man often haunted by his own inadequacies, fears, and pain – yet a man who found himself, more and more, turning to God for help – just to cope with the burdens of responsibility, leadership, and the healing of a nation. God cares for your soul and He has called you to trust Him and become an agent for His caring in the lives of other people. The Message of John - Repent! God called John to be a smoother and a “straightener”. In many ways, John’s role was nothing more than to clear away the obstacles that might impede the message of the one who would come after him. He was a voice in the wilderness. And he cried out with passion and conviction removing excuses and uncovering facades. To be an agent through whom all flesh might see the salvation of God. God has no desire to hide His salvation. He wants all to see it. He wants all to receive it. We have the task of removing the impediments. What kind of impediments are there? Sometimes mountains are too high, valleys are too low, and roads are too crooked and rough. We can cooperate with God to change that. One impediment to people seeing God’s salvation is our tendency to speak religious jargon that no one understands. We mask the grace of God in a jungle of theological language and church talk. Another is our insistence on traditions that have lost their meaning. Or it may be our own negativity or the contradictions of our lives – the dichotomy between what we profess and what we practice. We have to remove the obstacles that keep people from coming to Christ or even hearing the Word of God. The problem is not so much that people don’t want to hear as much as they sometimes cannot hear over the irrelevant chatter. Remove the impediments and let everyone see the salvation of God. Once a thriving industrial plant, the factory had ceased to be productive. Chaos was the order of the day. Supervisors could not predict who would show up for work and when. Even the unions were in a state of panic. The problem was attendance. It was the first time I’d ever heard of an adult business with an attendance committee. People were not showing up for work; but neither were they quitting or getting fired. Because of contractual clauses, they were remaining on the company and union roles and bleeding both dry in benefits. They wanted to be employees, but they didn’t want to show up for work. They wanted the benefits of employment, but none of the obligations. They didn’t even show up. That is the way John viewed the “generation of vipers” who came to be baptized. Some of them wanted the benefits of association with God and the symbols of covenant relationship, but they did not see the relationship between that and being useful. Fruit trees exist to bring forth fruit. That is their nature and that is their function. God’s people exist to bear fruit as well. It is both the nature and function of covenant people to be useful in the kingdom of God. John was harsh. He knew what orchard owners did with barren trees. They cut them down to make room for more productive crops. He considered it presumptuous of people to think that they should be allowed to continue being useless and not be replaced. Remember that John was preparing the way for the Lord. He was the voice that God used to flatten hills and make crooked roads straight. And he was telling it straight. He, like the law, was a schoolmaster to prepare the way of the message and messenger of grace. His role was to amplify the need for repentance and make it plain that God was not pleased with the status quo. We need to hear this word today. God wants our lives to bear fruit. If they don’t we are simply occupying space on Heaven’s roster. Show up! From the fruitless, John required fruit. From a brood of vipers, he demanded an answer. From complacent religionists, he called for a willingness to get real. Just because they had enjoyed the benefits of covenant, it did not mean that could not be replaced. Everyone is dispensable – even those who think they are not. Multitudes had come to be baptized. 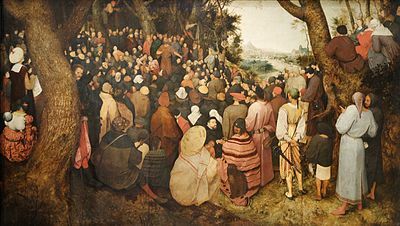 John was not impressed with his own ability to draw a big crowd. Crowds filling space do not equate to revival. Something more was necessary. If he had had a headquarters to report to, his report might have been quite impressive, but as we said, he was not impressed. He was looking for something more because God is looking for something more. John was preaching the possibility and necessity of life change. Why did they come? Was it a curiosity? Was it a desire to follow the crowds? Was it a fad? Or was it fear of being left out or worse – wrath? Some come out of wrong fear and some out of right fear. If you do not know the difference, read the book of Proverbs or visit the Grand Canyon. Right fear is awe and reverence; wrong fear is manifested in fight or flight reflexes. It is concerned only with self preservation and avoidance of trouble. John knows there is something more and so should we. Fruits of repentance are those changed attitudes and deeds that reflect faith in the possibility of life change. They grow out of lives that have been moved by a deep desire for a more fruitful life. Abject terror will not change our hearts. Judgment is real, but fear of judgment will not, by itself, bring us to repentance. God can do that inside of us and He is ready and willing to do so, but we must desire it and believe that it can happen. With great power there is increased capacity for doing good. Yet, there is also multiplied capacity for doing harm and engaging in individual and collective sin. When asked, John the Baptist brought a prophetic message to the guardians of the system. It was hard, but it was not hopeless. For John, repentance was not about feeling guilty and wallowing in that guilt. It was about life change and he contended that it was both possible and necessary. Repentance is for all. Our individual circumstances determine the nature of that repentance. In speaking truth to power, John zeroed in on areas of power's abuse. These were men of influence and power who came to John to be baptized, men who wielded authority over common people, who carried the sword and were authorized to use it to subdue, torment, and enforce. These men also had the capacity to abuse their power, to punish their enemies, to extract unfair compensation, to be bribed, to extort, ad to oppress. No one would challenge them. They had free reign to inflict violence and abuse people. John tells these soldiers to be very careful how they used their power. They would need to humble themselves and realize that they were called to live by a higher power than that of their captains or their swords. Having power would no longer be a license for them to misuse it to their own selfish ends. It is an awesome responsibility to have authority. It takes more grace to carry greater power. To be a covenant man or woman in a position of great influence requires fruits of repentance reflected in a servant’s attitude. One’s coworkers and fellow soldiers/officers may not be willing or able to reinforce such life change. Only God can, and he will. Stop doing what is wrong; live simply; share what you have; live for God. There are different things that different folks must do – but it is always very simple to take the first step. Stop doing the most blatant thing you are doing wrong. In the case of the hated publicans/ tax collectors: Stop cheating. To receive this message meant that they had to agree that they had been cheating – even extorting from their own people on behalf of a foreign power for their own enrichment. To do so would have been to come clean and mean business with God. The publicans had to learn that love is best and everything else is a distant second. Every sector of society has its own inherent temptations to sin. Every individual has a unique set of hot buttons that create pitfalls and weaknesses of the flesh. For each of us, fruits of repentance take on a different color and flavor, but they all share one thing in common – Possibility. We can do with God’s help and by His grace. The salvation that He wants all to see comes with the possibility of change. If we mean business, and zero in on our own vulnerabilities, we can embrace it. I am glad that God does that for me. I do the wrong and He atones for it. That means, He bears the brunt and makes it right. What kind of wonderful craziness is this? a wind that passes and comes not again." Are you feeling "stuck" in work you feel is insignificant and at the lowest place on the chain of importance? Are you doing menial work when you feel you have a greater calling? Look at David. His entire schooling was doing what kids do in a family like his - chasing ewes, shepherding sheep. Yet David, apparently, grasped the parallels. He realized that the lowest work was really at the heart of the greatest work. To serve, to lead, to protect a great people was really just a larger context of what he had been doing in his youth - shepherding people, like he shepherded sheep. He emerges from obscurity from among hundreds of thousands who had great potential. He emerges to lead. His significance was not hindered by his lowly position. He did that faithfully. The greater work came later --- yet sooner than he expected. He was taken from the sheepfolds and became the shepherd of a nation. David was not stuck; he was being grounded. It is a word of hope and desperation. It is a word that reflects sincerity and contrition. It agrees with The messenger of God that all is not right and needs to be made so. What shall we do when we look at our lives and see no fruit? What do we do when we realize that we are part of the problem, obstructing rather than constructing, reaping benefits without bearing responsibility, failing to live out the true purpose of our lives? What do we do when it becomes clear that we are keeping our names on the roles, but doing nothing to be productive? When we ask the question, we take a giant leap forward because it is pregnant with contrition and intention. The question opens us to what God wants to do in us and through us. It expresses repentance and prepares us for adventure. We can be more, do more, experience more, receive more. When we ask the question, we are on the verge of discovery that the real benefits of covenant relationship are intertwined with its obligations and opportunities for service. The real privileges come with embracing our calling. What we must do is ask what we must do. God loves the question and has an answer prepared, but He cannot or will not deliver it to us until we ask because we will not receive it. The application to the Christian life is the call to serve – more so, to BE servants, available, cheerful, ready, willing, even eager to be co-opted into His program. The good news is that God wants you. The questions is: Are we ready to ask the questions? Sometimes we are ready for a really complicated answer to the big questions and all we get is something like this. Live simply and share what you have. We’d really like it to be more complicated than that – and in some ways it is. But this was a start. It would certainly be a major change for the folks John was addressing as it would be for many of us. God always starts where we are. He doesn’t try to overwhelm us. He gives us small bites first and eases us into complexity and difficulty. He was simplifying things for Thomas and for all of us. John is saying that he would like to see some small indicators that folks meant business – indicators of a change of heart and mind which he could call repentance. “Show me,” he declares. What must we do? We must do something in character with heart change. Somehow, our lives, once moved by a new relationship with God, must reflect a transformation of values. Suddenly, there is something more important than having more than we need. Maybe one coat is enough – or one car per driver or a few less toys. Turning our lives over to God is not rocket science. It is not a burden that none can bear. The Christian ethic is simple: Live simply and share what you have. Do the right thing. Oh the wonders He has done! The wonders done and to be done. Give ear, incline, and hear this word. Are grace bestowed and undeterred. The world needs non-violent witnesses of Jesus to walk unarmed, vulnerable, and faithfully bold, trembling, but walking on among the clamoring, posturing, outbursts of angry violence and ignorant hate to stand for love, justice, and peace. These shall neither relent nor retaliate. They shall neither defend nor disperse. They shall not excuse nor accuse. That shall bear witness. For some it will be in public places and for others, spaces like this. All sides will accuse them of being on the wrong side but there is only one side and few stand on its ground. Worthless religion? That connotes that our religion ought to be worth something to someone other than ourselves. It is not just our eternal life insurance policy. It is to have value to other people, to our communities., to our fellow believers, to the world. There are many unbridled and unkind tongues in the world today who justify their bitter speech by saying that they are speaking truth and truth hurts. Truth does hurt - but it is healing hurt and it is the truth itself that hurts, not the delivery of it. When I had to give myself injections of a blood thinner after a blood clot some years ago, I soon discovered that the needle itself was very gentle and did not cause me pain. Once inside my body, the medicine had a sting and actually causes some bruising. It was quite bearable because I knew it was healing me and helping to keep me alive. E– Examine your life honestly in the light of God’s Word and admit your need of a Savior as a result of sin. The Holy Spirit will guide you through this process of conviction if you are open. L– Let go of your sinful resistance and self-centered control of your life. Another word for this might be repentance, a turning from sin to God. I– Invest your life completely in God. This is basic, gut-level trust and is necessary for the new life in Christ. Express this change of heart to God in prayer. E– Eternalize your values. Stop adding up your assets the old way. Understand that eternal reality is true reality and that only what lasts forever is worth our lives. V– Visualize a new life of freedom, forgiveness, and fullness based upon God’s grace, mercy, and power. This is the beginning of the exercise of faith in your life. E– Embody the life of Christ within you by receiving the gift of the Holy Spirit, His indwelling presence. This is new birth. First, it is important to distinguish that, while God is the author of wisdom and is all wise, this is not God speaking through God's voice. This is wisdom speaking. It is an important distinction. While God appreciates the irony of our rebellion, it does not delight Him, but grieves Him. Wisdom's laughter is the impersonal and inherent humor of poetic justice. When Haaman is hung in the gallows he built for Mordecai in the book of Esther, that same instinct that cheers for the Roadrunner in the cartoons and laughs at the Coyote kicks in. Wisdom sees the intrinsic dark and tragic humor of what transpires. Specifically, here is a know-it-all who refuses all the overtures of truth and discretion. He will not listen to advice; he scoffs at learning from the experiences of others; he is offended by correction; he is haughty, proud, and self-assured. He struts out of life's classroom and immediately falls in a hole that he was warned would be there. That is funny is a sad sort of way. God is weeping; wisdom is laughing. God sees the tragedy; wisdom sees the irony. God keeps loving this wayward one and wisdom keeps reaching out, hoping that he will have learned to laugh at himself as well and listen the next time. If he is wise or at least wiser, he will be laughing harder than anyone - though he be bruised and torn and weeping with God. We need to learn from our mistakes. When we do, we truly learn and are better prepared to be the subject of our own victory stories rather than the brunt of our own jokes. Is God In the Storm? What is God's role in natural disasters? Naturally, after making a good system, God expected us to learn, respect, and follow the laws of nature. He often helps us when we clash with nature and gives us peace in the midst of storms. We can also learn the important lessons of environmental stewardship as we reassess our life styles. We live and learn as we respect the truths of divinely ordained science and natural processes of well designed world. Above that, God reveals Himself primarily in the prayers, deeds,and compassionate gifts of people who love Him and love their neighbors as themselves. If you want a hint, look at Jesus in storms. Or check the times that Jesus was asked to equate suffering with someone being a worse sinner than someone else. He always deflected it at went back to a larger subject. Is there a lesson? Always. Nature is powerful. The Creator of of nature is even more so, but at the core of all holiness is the harmonic and reverberating theme of love. If you want to align with the message of God in moments of human suffering, reach out in love to your neighbor. The rest is religious arrogance and pseudo repentance designed to deflect from our own sins of pride, superiority, and reluctance to care. The heart of God is holy, ruthless, furious love. The heart of God's people is to flesh out that love in service to suffering humanity without judgment or conditions. Beyond the labors of the hands. So that no one understands. And not all can be certain. Weary is her mind and body. Weary are his hands and feet. That souls longs for respite and fulfillment. Yet, that soul cannot rest. The roots of the word, "fatigue" are from Latin as well as French. The meaning has not changed much. To be fatigued is to tire. But originally and in pre-Latin, it carried with it the idea of being driven to the point of breaking down. In health, it implies lethargy and in psychology, the notion of being emotionally drained. Our frustration boils and we wonder why we keep on keeping on. Yet, we do not quit. We cannot quit. "Come unto me ... and rest," our Master calls. Then, we get back to it. Fatigue can either kill us off, sideline us, or move us to greater dependency on God's power to work in us and through us. How do we handle the fatigue? Let's break down the word so that it spells the resources we have to fight it. F - Faith. We walk not by sight, but by faith. We walk without guarantees or instant gratification. A - Acceptance. The world is what it is and we are what we are, flawed and limited. Not all things will go well or show results within our expected timing. T - Tenacity. No matter how hard it is, our commitment moves us forward. Even when we don't feel like speaking, writing, acting, or standing, we do because the cause is greater than we are. I - Inspiration. We seek it daily from the words and the Word we read to the songs we sing, the prayers we pray, and the words of encouragement we gather around our hearts. We must be fed inspiration. G- Grace. Grace is the gifting of God in us and God's way of dealing with us. We do the best we can within our limitations and in spite of our failures, and we drink the fresh cooling waters of grace that reminds us that we are beloved and accepted. U - "Upwardness." We remind ourselves that we are traveling the "upward way." We have a higher purpose and a higher calling that is beyond this world this time, and our own identity. We are aligned with the Kingdom of God and a heavenly purpose. We are involved in great work that makes a difference. E - Energy - We draw our strength from the Spirit. In that way we do not wear ourselves out. We move at His pace. We find the places of rest. We refuse to work through tension, guilt, and mere human effort. In trust, we move with the flow of God's energy and make ourselves available for it to flow through us. But we are all important to a larger purpose. Make fatigue work for you. How is it that a small word or two of encouragement can make all the difference in a person's day? One compliment can turn the tide for another person's day or week. One blessing softly and sincerely spoken can lift a downtrodden spirit. A brief prayer can evoke the release of a flood tide of emotion cleansing the soul of a broken life. One "You can do it" can be heard and acted upon to catalyze change in an entire community or world. One hand placed gently and firmly on a shoulder can transfer courage and strength. One compassionate gaze into the eye of a lonely heart struggling to express what is hidden deeply inside can bring relief and hope. One word or two. That is all it takes. One moment of caring. One pause to refresh another. It costs us so little and gives so much. Standing on tiptoe in expectancy. Living breathless in the wind. Waiting with expectation among the voices of boredom. And the calming music of sacred choirs. And yet, there is silence. I am quiet before you, Oh God. Is to know You and present myself to You. Yet, it is Your gift to me. I have nothing in my hands. I hold no bargaining chips. There is no reciprocity conceivable. I make no case before You. In Jesus's Name, I come. Was it his parents? Or was it him? They had read parts of the scriptures, but not all. They had left out vast portions that spoke of the mercy of God who, while having the right to inflict pain and suffering upon disobedient people, had so often, in mercy, relented. And they had not read the book of Job or so many passages that revealed the suffering of the righteous. But Jesus knew that this blindness, unlike the blindness of those who were critical, was so that the glory of God might be revealed in a poor beggar man. Other eyes, spiritual eyes could also be opened, but it would require a miracle from God and the willingness of the recipient. That man had his eyes opened, but other eyes remained closed. There is a blindness that is, without a doubted, rooted by sin, perpetuated by sin, and symptomatic of sin. That is the blindness that obscures the vision of grace, that clouds our view of God’s nature, and causes us to stumble through life without direction or purpose. It is that blindness that Jesus is ever ready to heal. He does so regardless of our theological sophistication or worthiness. Of course the man was a sinner, but that fact was not relevant that day, because Jesus was viewing him through the eyes of mercy and grace. His new sight would bring glory to the Father even as yours will evoke the praise of men and women for Him. Later, with new eyes, a willing heart, and deep gratitude, he would joyfully believe and follow. Like this man, you did not become a believer because of your wisdom or theological sophistication. All that you are today comes from a time when a gracious Lord opened your eyes. “I see,” we say and we mean that we understand. “I see,” we say, and indicate that something which was formerly behind a cloud has had the light of day shine upon it. “I see,” we say, and breath a sigh of relief because the struggle to comprehend has ended and the fog of confusion has lifted. “I see” we say, sometimes with slight embarrassment because it was so simple all along. That with which we wrestled is no longer an obstacle, but a friend. That which was such a barrier to truth has become the key to all mysteries. “Now I see,” and we do not speak it, but sing the joyful news. No longer need we wander. No longer must we be the slaves of those who lead us along, but who are also blind. No longer must we repose in darkness without the light of blessed hope. Why do we crawl back into the darkness now that Christ has brought us light? Why do we sleep through the daylight hours? Why do we act as if we have no direction? Why do we keep bumping into the same obstructions on our path to truth? Why do we shut our eyes and flounder in a haze of existential ambiguity? Why are we attracted to dark things? We have a choice. There is still within us the memory of blindness and sin and it holds some sort of nostalgic appeal to us. But we must remember that the misery of it all was always greater than its perverted pleasure. It was pleasurable for a season, but those seasons got shorter and shorter and less and less pleasurable. We can see now and we can choose. We can say to Jesus, “Tell me who He is and I will believe in Him.” He will point to Himself and we can follow Him. He has opened our eyes and we are without excuse. I notice that I wrote and posted the following nine years ago. The context was different, perhaps and perhaps not. The core issues are the same and the desire for places of meeting with respect and open minded dialogue are the same. I must confess that I dislike controversy. I can tolerate it in others, but I realize dislike being controversial. I think the reason is that I know that when I am most controversial, I stand as much chance as anyone of being wrong. I don't even agree with myself some of the time. I also know that when I criticize anyone I am often just as guilty of the same sins in other contexts. I know that there is a measure of good in me and I believe it is Jesus within me. I also know that there is plenty of not-so-good in me and I am totally responsible for that. The other problem is that the moment one takes a position about anything, people jump to all sorts of conclusions and start associating you with positions you did not even address. "Everyone who thinks this way about that thinks that way about the other and holds this view about thus and so and is a died in the wool you know what." As absurd as that sounds, it is how we think. Take away our neat little boxes that have been constructed in our ideology factories and we feel naked, exposed, and lost in a world of ideas. Our solution is to get in our boxes and force others into theirs and start pulling out our labels and along with those labels, characterizing this one as 100% good and the other as 100% bad. Most of our parents and grandparents knew better than to do that. There used to be a graciousness, courtesy, and gentility in America that I long to see again. People thought the best of each other. They had patience with human foibles. They made allowances for the weaknesses of their fellow human beings. Or am I idealizing the past? Whether I am or not, it is the kind of future I desire to see and the kind of present I want to work on. In the meantime, I need to work on my reluctance to being controversial. My good friends will like me no matter what I think or write. "Neither Do I Condemn Thee." Jesus said that wheat and tares would grow together until the end of time and that in the end, God Himself would sort them out. Until that time, we are called to live without the burden of judging others, without condemnation, and with a solemn commitment not to destroy anything of God’s planting in the futile process of sorting our evil people from good people in this life. Not everything that grows in a field is what we have planted. Not everything that we plant grows to maturity. Still we plant and water. Still we wait in expectation. Many would have discarded the woman caught in adultery if they could have done so without condemning themselves. They would have relegated her to the trash heap of humanity as someone soiled, sullied, and unworthy of grace. He refused to cast her away, but sent her away with mercy and hope. “Go and sin no more,” He commanded her with the built-in hope instilled in her heart that such a life was now possible for her. Let us look unto the fields as they are white unto harvest and be ever so careful not to destroy any soul that God has planted through our own premature judgment of them. Let us see every person as a potential part of God’s harvest of grace. Let us labor in His fields with love and hope. How and why we use our words matters. Continue to store us away from the strife of tongues and may our tongues not cause strife. In a day of many wagging tongues and much strife and verbal violence, may we speak grace and filter out the graceless dissonance from our spirits, while hearing the genuine pain and heart cries of our broken and wounded neighbors. May God's abundant goodness be upon us. May all these blessings come to you, my friends. from the strife of tongues." In a day when we, as Christians, feel compelled to protest our losses of special privilege, criticism, insult, offense, or false characterization of our motives, we have a role model for how to handle it. After saying all there was to say, he just went silent. He was not standing there to defend himself. After speaking truth, he simply embodied it with humility, grace, confidence, determination, and non-resistance to the consequences. It was his silence that amazed Pilate.
" And Pilate again asked him, “Have you no answer to make? See how many charges they bring against you.” But Jesus made no further answer, so that Pilate was amazed." May you be blessed today, people of truth, souls of deep longing, heart walkers of grace, grace walkers of broken hearts, life livers and life givers. May you be blessed. May you be blessed, people of the edge, marginal pilgrims, shaky saints, trembling travelers, limping leapers, and lovers of humanity whose hands are extended into the darkness to those who dwell there, who enter the abyss with a light that gradually dissolves the fog of ambiguity and despair. Be blessed soul travelers, guided guides, voices of hope, fellow stragglers who stagger toward something that glimmers in the darkness and the distance, swerving, swaying, yet mercifully, on course. Be blessed, you who often fall down and mostly, rise up. Be blessed, wounded neighbor, scabbed, scarred, healing healers. Be blessed, you faithful doubters and doubting faithful who continue and thus, shake off the weights of those doubts to confidently live on. Be blessed, witnesses of The Presence, who, with myopic eye, have seen and see and say, "Here is God and God is here." My comrades, my kinsmen, my fellow lovers of God and people who continue and conquer through the One who loves you, Jesus people, followers of that Way and those called to follow whose calling has not be heard or comprehended, but who are being drawn or shall be drawn, my beloved. all you who wait for the LORD!""